EUGENE, Oregon – Sprinters ruled the NCAA Division I Women’s Outdoor Track & Field season, so it’s only right one made history Saturday at Hayward Field. 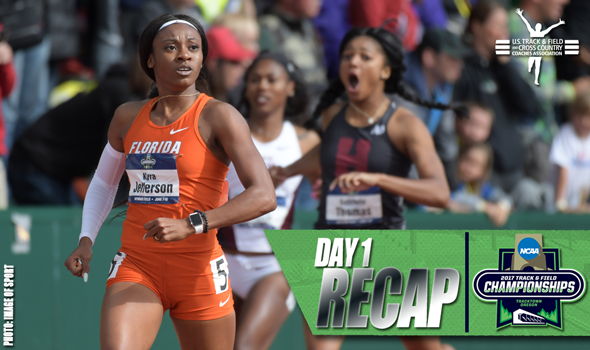 Florida senior Kyra Jefferson broke Dawn Sowell’s 28-year-old collegiate outdoor record in the 200 and fended off Oregon junior Deajah Stevens, now the 3rd fastest woman in collegiate history at that distance, to win the race. Jefferson and Stevens went stride for stride as they broke away from the pack with about 75 meters to go. As the finish line neared, Stevens lost her footing and the 2016 Olympic finalist tumbled to the track. That left Jefferson all alone. History couldn’t wait as Jefferson crossed the finish line in 22.02. Sowell ran 22.04 in 1989. Oregon’s Ariana Washington ended up finishing 2nd in 22.39 and that margin of victory (0.37) was the largest since the all-time meet best of 0.44 was set in 1992. That was 1 of 4 collegiate outdoor records to fall during the 2017 NCAA Division I Outdoor Track & Field Championships. Christian Coleman (100) and Maggie Ewen (hammer) established their standards on Wednesday and Thursday, respectively, while Jefferson and Oregon’s 4×400 relay team notched theirs on the final day of competition. Even though Jefferson’s record stole the spotlight – and rightfully so – there were many other outstanding individual performances across the board. A few events before anchoring the Ducks’ record-breaking 4×400 and securing the third team title in program history, Raevyn Rogers became the first woman in meet history to win three consecutive 800-meter crowns. Rogers won in 2:00.02, which is equal to the 6th best effort in collegiate outdoor history. UTEP’s Tobi Amusan knocked off defending 100-hurdle champion Jasmine Camacho-Quinn of Kentucky and clocked a time (12.57) that made her the 4th best performer in collegiate history. It was a reversal of fortune from 2016 when Camacho-Quinn won and Amusan finished runner-up. Georgia’s Kendell Williams won the heptathlon by 306 points, the largest margin of victory in the past five years. Williams earned her 7th career multi championship and ends her career with one blemish – a runner-up finish to Akela Jones in the 2015 heptathlon. And like Rogers, Georgia’s Keturah Orji added another event title to her haul. Orji easily won the triple jump and notched the 4th farthest all-conditions mark in collegiate outdoor history. Let’s not gloss over what Ewen accomplished either. In addition to setting the hammer record, Ewen finished runner-up in the discus and 6th in shot put to give her a total of 21 points. Ewen was the high scorer of the meet, regardless of gender.